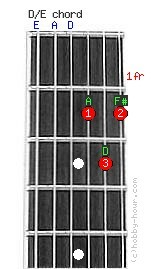 D/E slash chord's notes: E, A, D, A, D and F#. The strings 6(E), 5(A) and 4(D) are left open. The D/E slash chord is a simple D major chord with E as the bass note.